We long ago learned that the two most important things to people looking to sell a car are that they get the most money possible, and that we respect their time. That starts when you first contact us. We're here to answer your calls with extended business hours Monday through Saturday. If you'd prefer to contact us via e-mail, or ask for a quote using our simple online form, you're welcome to contact us 24/7. We'll get back to you first thing the next morning, or at a time of your choosing. We frankly don't need a lot of your time to understand what your vehicle is worth. We'll quickly make the best cash offer possible. 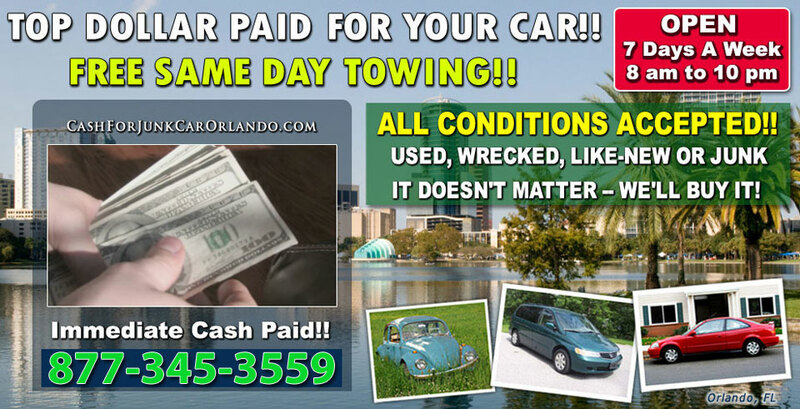 If you accept, we'll then simply ask where and when we can meet to pay you, and provide free car removal. We can even schedule Sunday and night pick-up if that's what you need. Whether you have a junk car or a vehicle that still drives well, we'll arrange pick-up around your busy schedule. If you call us on a Monday morning, we can usually pick up by the end of day. Call us late on Tuesday, and we will probably need to arrange pick up for Wednesday. We're always fast, free, and on-time. When we meet, we'll simply ask you to sign over the title, and we'll pay you the promised cash. We've worked long and hard to make it look that easy.